Dr. Wright received his B.S. from California State Polytechnic University- Pomona and his D.V.M. from Ross University, located in the wonderful Leeward Islands (St. Kitts). After spending three years at Ross University to fulfill his veterinary degree, he then went on to spend a clinical year at the University of Missouri. 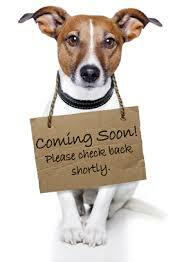 Upon his return to Southern California, Dr. Wright worked at County Line Animal Hospital for 2 years. 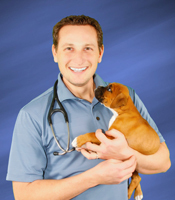 Dr. Wright lives in Chino Hills with his wife Robyn, their 2 children, and their 6 pets - two boxers (Brinley and Ziggy), a mixed breed rescue (Marley), one crazy sweet little kitty (Sandy claws), and two guinea pigs (Twinkle and Powder). Dr. Wright enjoys the outdoor world whether that is going 4 wheeling in the desert, dirt bike riding in the sand dunes, or racing one of his cars at the track. Caitlin has been with our hospital since 2006. She is proud mother to daughter, Alana, two dogs and a bunny. Steven has been with our hospital since 2005. In 2008 he obtained his AS in animal science. 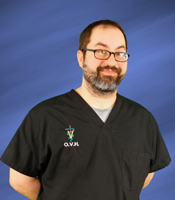 In April 2016 Steve acquired his Registered Veterinary Technician license. He is dad to a beautiful little girl, and a cat named Trouble. Aly has been with our hospital since 2017. Robyn has been with our hospital since 2016. Paloma has been with our hospital since 2016. Amanda has been with our hospital since 2018. Kathy has been with our hospital since 2017. Liz has been with our hospital since 2017. Diana has been with our hospital since 2018. 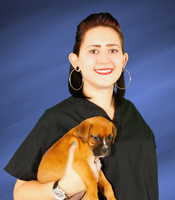 Brianda has been with our hospital since 2018. Ryan has been with our hospital since 2018. Cecilia has been with our hospital since 2018.